As much as I’ve grown to love duck in my adult life, it certainly wasn’t a part of our diet when I was young. In fact, the only memory I have of duck being served took place 40 to 45 years ago and isn’t so much about the duck but the surrounding circumstances. I’m afraid Zia is not who you think she is. When I was very young, frozen foods were just becoming widely available. By the time I was in high school, my Parents had bought a rather large chest freezer, placed it in the basement of the old two-flat, and both families took advantage. After all, it was far larger and the temperature much more consistent than Grandpa’s window box that he would install every Winter. Not only that, but having a freezer meant that Mom and Zia no longer had to rise before dawn on the holidays to make ravioli for the big dinner. Holidays would never be the same for the two Sisters. By the time the freezer was being filled, my siblings and I were older and occasionally there’d be a night when none of the 3 of us were home for dinner. With Dad working at the restaurant, that meant that Mom ate alone. On one such night, Zia invited Mom to join them for dinner. She had roasted a duck! Mom gratefully accepted and everyone seated at the table commented how delicious the duck was. At some point, Mom asked her Sister what possessed her to roast a duck in mid-week. Was she celebrating something? No, Zia had been looking in the freezer that morning for dinner ideas, saw the duck, and decided to roast it. That’s when Mom realized that Zia, that dear sweet woman you’ve all grown to love, was a duck thief. She had stolen Mom’s duck!!! Now, we have kept her criminal past secret, within the family, but it’s time to air the Bartolini dirty linen. Besides, as far as crimes go, this one was victimless — save for the duck — and to her credit, Zia did share her ill-gotten gains with the duck’s true owner. Mustn’t forget, too, that by all accounts, it was delicious. That’s important because, to my knowledge, it was the last time that duck was served at the two-flat. Mention roast duck today and, with a smile, Zia will recount the story of the day she became a duck thief. I truly enjoy cooking these dishes with Zia. This one really hasn’t been prepared in over 40 years and, even then, it was a rarity. As such, it would be so unfair of me to expect her to remember the recipe, especially since I cannot remember what I was doing 40 minutes ago, let alone 40 years. So, we collaborate and, while doing so, she tells me tales from back in the day, like how she became a thief. It’s a fun afternoon followed by a great dinner. You just can’t top that. I think you’ll find that there’s nothing complicated about this recipe and, if you’ve been around here for a while, the herbs we used should come as no surprise. As I’ve said before, neither Mom nor Zia used many herbs and spices in their cooking. What few they did have were usually reserved for baking. You will, also, note that there was no sauce/gravy to accompany our duck. This was how my family served it. The duck was plenty moist and very flavorful, so, we went with tradition — and I spirited away the duck fat to play with at some later date. Season duck’s cavities with salt and pepper. Place one garlic clove in the neck cavity and the remaining garlic, onion, and lemon into the abdominal cavity, along with the sage leaves and sprigs of rosemary and thyme. Use kitchen twine to tie the legs. Fold the wing tips under the duck’s back. Use a skewer or similarity pointed object to pierce the duck breasts a repeatedly. (See Notes) Coat lightly with olive oil and lightly season the breast side of the duck with salt and pepper. Place the duck on the roasting rack, breast side down. Coat lightly with olive oil and liberally season the back with salt, pepper, and 1/3 of the chopped herbs. Place in the pre-heated oven for 30 minutes. Remove from oven, turn duck so it is now breast-side up, season with remaining herbs, and return to oven. Bake for 90 minutes, basting every 30 minutes. After final basting, raise oven temp to 375˚ F (190˚ C) for another 30 minutes to crisp the skin. Let rest for 20 minutes before carving. Piercing the duck breasts will allow more fat to drain during initial phase of roasting. Generally speaking, roast the duck for 25 minutes per pound at 350 F (180 C). We roasted potatoes along with our duck. When the duck was removed to be flipped over, we reserved a couple tbsp of duck fat and a little of the chopped herbs. Once the potatoes were washed and dried, we seasoned them with the reserved herbs, salt & pepper, and duck fat. At the 2nd basting, with another hour of roasting yet to go, place the now seasoned potatoes on the roasting rack. Baste them along with the duck and roast until the duck has finished cooking. My Italian holiday came to an end in the Eternal City, Rome. There is, quite literally, no place like it on earth. Where most cities exalt their histories, Rome’s past is there, right before your eyes. The Colosseum, Pantheon, Palatine Hill, the Forum, the list goes on and on. If you’ve any interest at all in the Roman Empire, Rome must have a place on your bucket list. But what if you couldn’t care less about the ancient Romans? Perhaps fine art is more your thing. Then head to Vatican City and get in line to see the Papal art galleries. Words cannot describe the sheer size of the collections. Following the marked route, you’ll pass through gallery after gallery of works painted by the World’s masters. Be sure to look up occasionally as you walk, for the ceilings along the route are incredibly beautiful. You’ll probably peer into galleries featuring statuary from early Greek and Roman times, as you pass on your way to the Sistine Chapel. With walls painted by some of the Renaissance’s finest artists, Michelangelo created the fresco that adorns its ceiling and front wall. The ceiling depicts various scenes form the Book of Genesis, as well as some notable biblical figures, while the Chapel’s front wall contains Michelangelo’s masterwork, The Last Judgment. Guaranteed that no matter how much time you set aside to tour the Vatican, you’ll wish you had more. The Vatican isn’t the only place where you can find art. Head to the Church of St. Peter in Chains, San Pietro in Vincoli, where you’ll find Michelangelo’s marble sculpture, Moses. Of course, you could go to the Church of Saint Mary of the People, Santa Maria del Popolo, to see Caravaggio’s Martrydom of St. Peter, as well as his Conversion of St. Paul. Take a moment to view the Chigi Chapel which was created by Raphael and that contains statues sculpted by Bernini. If it’s Caravaggio you want, then you really must walk over to the Church of Saint Louis of the French, San Luigi dei Francesi. Beautiful in it’s own right, to the left of the alter is the Contarelli Chapel containing masterworks by Caravaggio, depicting three events in the life of St. Matthew: The Calling of Saint Matthew; The Inspiration of Saint Matthew, and The Martyrdom of Saint Matthew. Like so much of Rome, this little cappella will leave you breathless. Next, and last, is the heart of ancient Rome, the Forum, and its neighbor, the Colosseum. 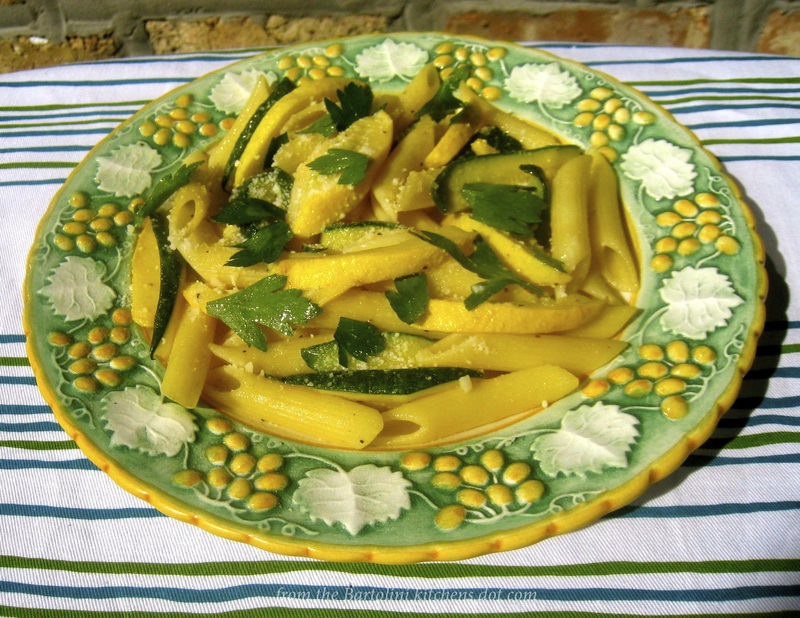 With our gardens and markets still brimming with zucchini, both yellow and green, today’s look back features a pasta dish that isn’t quite as it appears. Containing zucchini that’s been cleverly chopped to look like penne, this is one way to enjoy pasta with only half — or less — of the carbs. Did I mention how tasty it is? You can see the recipe by clicking HERE. This entry was posted in Family Recipes, Main Course (Secondi) and tagged Cooking, Duck, family recipes, Food, Italian, Recipes by ChgoJohn. Bookmark the permalink. John, I love your family stories! Such a treasure that you are documenting them forever. As for the duck, well that is just gone onto the menu for my visit, after all, it will be a special occasion. I wonder if I will ever have the privilege to visit Rome one day, it is such a beautiful place. Have a wonderful week John. Thanks, Mandy. Living as we did, in an extended family, each of us has our own treasure trove of stories to tell. All it takes is one little “Do you remember …?” at the dinner table and we’re off and running, each of us with our own spin on the tale. I hope you’re having a great week and will have an even better weekend. I love roast duck and yours looks delicious, John! You know? I don’t eat it often either but this dinner made me want to do so more often. It really was that good. Lovely photos of Rome. I would love to go back again, someday… there’s so much to see there and to taste! I don’t believe that Zia is a true duck thief. Why else would she have invited your mother over to share in the enjoyment of the “loot” if she had really intended to keep the stolen fowl all to herself, or ‘duck in cheek’ as they say? Rome is a city without parallel. I do hope you can get back there one day. No matter how many times I go there, it has never lost its wonder. Great story! Your posts are always fun to read. Love the Zia “duck thief” story. Bet she shares this part of her past with twinkle in her eyes. That duck sure look mouth-watering delicious. Looking forward to reading about how your serve it in future posts. Perhaps I will, one fine day, have the opportunity to visit Italy especially Rome. I sincerely hope that you do get a chance to visit Rome. It is sure to exceed your expectations. Like Pompeii, there is no place like it. Thanks for the tip on piercing the duck. I’ve sometimes eyed them in the grocery store; am glad I didn’t get one before knowing this step in the roasting process. Love the photo caption. This ain’t even Manhattan, let alone Hooterville! Zia shoot a duck? I’m sure she’s contemplated shooting me for a couple stunts I’ve pulled on her but that’s about as close as she’s come to shooting a gun. You do remind me, though, of my Dad. During deer season shortly after he and Mom retired to live next door to Zia, he saw a large buck nibbling on apples to the rear of their property. Hurriedly, he got his gun, loaded it, and took aim. Just as he was about to pull the trigger, the buck looked up and stared back at Dad. He put the gun down and never picked it up again. This is a recipe I am definitely going to try John when I see duck in the supermarket! I enjoyed your Italian views. They are so different to the ones I see here everyday. Thank you, Colline. I hope you enjoy your duck. We sure enjoyed it! As you can well imagine, I’ve a great number of pics of Rome, especially considering I’ve been there several times. I try to post those that not only remind me of the place but of that day, as well. A few of those shown above were taken on my last day in Rome, as I strolled around looking for a chitarra. I didn’t bring home a chitarra — I ordered one here — but I sure did bring back some great memories and photos. What a wonderful family story. It is stories like that which make family get togethers so fun! The reminiscing and teasing of family members, true family love. As for the duck, it looks absolutely delicious. Something that tasty does not need any sauce. I’ve a feeling that, in not too many years, your family will have more than its fair share of stories to tell and enjoy. Any household raising 3 boys is fertile ground. 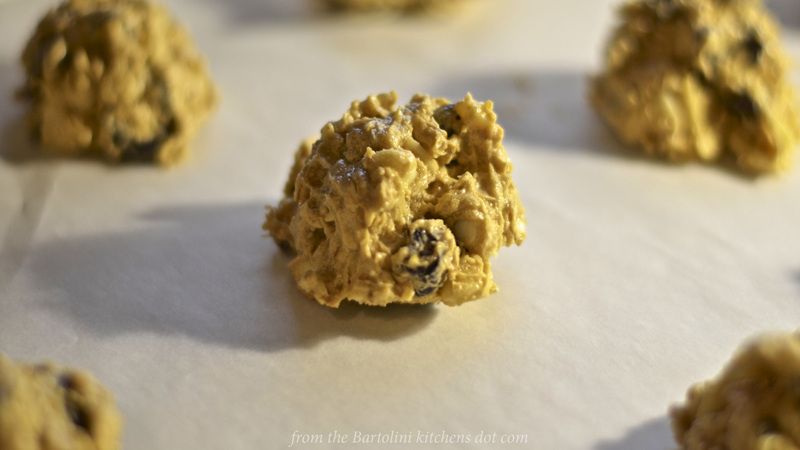 The cookies are oatmeal with dark & white chocolate chips, dried cherries, and slivered almonds. They do need a better name, though, they were a big hit in the family that lives above me. A great yarn, John. Made the duck even more mouth-watering! That’s so funny – Zia the duck poacher! I love roast duck and use pretty much the same seasoning, though I put it on the inside and allow it to permeate from in there. I have been to the V&A museum, the first time in ’90 and the second in ’95. Yes, I do remember the Column there. Amazing! Well, it’s just one of many amazing things to see there. It is one of my favorite museums in the World. Poor duck,but very Nice to eat John,Bellissime le foto di Roma,bravo!!!! I just knew Zia had a little mischief up her sleeves;) I can imagine your mom’s face when she realized she was eating her own duck! I’ll bet she made sure she had seconds.. Mom and Zia were very close. They love to prank each other and mailed the same card, back and forth, on the other’s birthday. This went on for years and always got a laugh when it appeared in the day’s mail. Duck is such a tricky bird to roast, I am always afraid I will ruin it…. great story, great photos, it is wonderful that you can bring all these stories to life in your blog! Your family has a big treasure in you! I know that fear, Sally, but this was so easy to prepare and so tasty that I’ll have no qualms about roasting another. Piercing the breast and roasting it, breast-side down was the key. Who knew Zia was a duck thief! But she does a good one — perfect recipe. Although I like duck, and like it a lot, for some reason I rarely cook it. I did one last winter, and that’s the first I’ve done in at least 10 years. Maybe more — my memory and 40 minutes is pretty much like yours. And thanks for more travel pictures and notes! I love Rome — one of my favorite cities. I, too, shy away from duck but, after this time, I’ll gladly make it again. It really was a great dinner. You’ve probably guessed that I share your love of Rome. It really is special, isn’t it? I managed to get on line and yours is the first post I headed to! Brilliant story about the duck – I hope Zia went to confession afterwards 😉 Lovely recipe too – duck is so packed full of flavour, it doesn’t need much fussing! No duck story to complete with yours, but I have a coliseum one….when I was little we always stopped in Rome to see the aunties and uncles before we all joined forces and carried on south to Calabria. A visit to the coliseum was always on the agenda and I asked Papa why it looked like it did. He told me that during the war a little girl from a poor family used to go every night to steal a few stones to help rebuild her fireplace (which then became her house as the story gained momentum) which had been been bomb damaged. Every night she went, and without anyone seeing her she took a few more stones and then the end of the war arrived and half the coliseum was missing! I really believed this story for a few years but eventully cottoned on to the truth…especially when I wanted my dad to take me to see the girl’s rebuilt house! Wow, what a recipe and what beautiful travels. This is some post! Thank you for sharing all of this. Beautiful. Such a wonderful comment to leave. Thank you, Amanda. Your Anatra Arrosto is very well done. I love it. And I love your pictures of Rome too! Great story, John, and a great looking roast duck. I love duck but I am in the distinct minority in the household. As such, I don’t cook it very often. Yours looks divine. Potatoes in duck fat – my favorite! Thank you. I’ve never heard of anyone that’s visited Rome that didn’t want to return. It really is a special place. Truly one of a kind. Despite all the tourists! 🙂 Driving in Rome was almost as bad as Athens. Quite the experience! Although I’ve driven in Italy, I’ve picked up the car at Fiumicino Airport and purposely avoided Rome altogether. I applaud your bravery, though I did drive around Naples. Never again! Naples seems to be a nightmare! Ah ha!!! Zia, the duck thief – although how many food thieves do you know who would turn around and cook the stolen food for you? I’d share my freezer with someone who did that for me. I haven’t made duck in almost 40 years. There just aren’t the same places around that carry specialty meats. Did you ever look at the Colosseum and think…”hmm, with a little work, knock down a few walls, add some elevators…that could make nice condos” ? Sorry, just how my mind works sometimes. Fantastic multifaceted post John. How you keep that Zia around is beyond me, given her history! Hi John, what a great story and a great recipe! The only way I’ve ever prepared a whole duck is as Peking duck, where it’s really only the skin that is eaten. I am really curious about this way to prepare duck and I guess there’s only one way to find out… Nice photos of Rome — I love the place, too! You’ve never prepared roast duck an I’ve never enjoyed Peking duck. What a pair! 🙂 Honestly, Stefan, I’ve not prepared duck very often at all. That’s going to change, though, thanks to Zia. This was delicious and not at all difficult to make. And it was a wonderful afternoon spent in the kithen with her, too. I prepare duck breast all the time and it is very tasty and tender red meat. I also like the legs, either as confit or sous-vide. Both breast and legs are more easily available around here than whole ducks, especially fresh (which I prefer to frozen as that gives the breast a metallic livery taste). I’ve not seen fresh duck around here at all, Stefan, other than at the live poultry shop. Duck breasts, though frozen, do seem to be more widely available lately. You remind me of a Thanksgiving quite a few years ago. I was in a butcher shop that I’d driven past but never entered. While there, the butcher mentioned that if I wanted a fresh turkey for the holiday, that I should order it then and there. Why not? So I ordered one and picked it up on the Tuesday before, intent on brining the bird. Imagine my surprise when I picked up the bird and it was frozen solid. Obviously, his idea of fresh was far different than my own. I had little choice but to take the bird, it was at least hormone and injection-free, but I never returned to that butcher. P.S. When buying duck in the US there is a difference between ducks that have been raised for the foie gras of which the meat is only a by-product and of lesser quality than other ducks. I am aware of the difference, Stefan, and have always assumed that the duck I purchase was not used to create foie gras. Considering our lax labeling laws, perhaps I should re-think that assumption. I understand Zia’s temptation! Roast duck so good. Ah Roma, a distant memory for me, but I do remember vividly the wealth of the Vatican galleries. I was awestruck the first time I walked through the Vatican galleries. Nothing can prepare you for the size, breadth, and quality of those exhibitions. Nothing. Love it! Zia the duck thief! 🙂 Gorgeous post John… such a delicious meal that you made and shared together… and well done for stashing away the duck fat for a later day! Very wise indeed! I’ve not spoken with her since the post was published and I cannot wait to hear her faux protests. I do hope you can get to Italy and Rome, Margot. You’re going to love it! It is everything you hope it would be — and so much more. As I said, there’s no place like it on earth. Have a great weekend, BAM. Start making plans to visit Rome. You’re going to love it!. 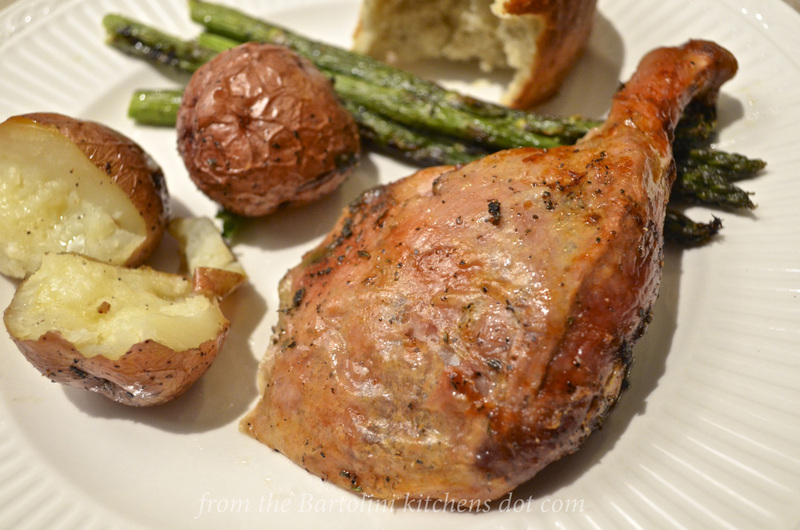 not a fan of duck (unless his name is Daffy)…I’ll eat the asparagus & potatoes tho….they look good. Did you make a wish at the Trevi fountain? Yo apparently didn’t see/read the caption for my Facebook photo. I love meals that have a story attached to them, as each time time the meal is enjoyed so is the story once again. And Zia did the right thing, cooking and sharing the duck in my view, not keeping it for an occasion but making the every day better. I recently roasted a whole duck for the first time. It was both daunting and delicious. I am quite squeamish so the long neck rattled me. I froze the leftover cooking liquid-stock and accompanying cherry sauce which I’ll be using to slow braise beef cheeks this weekend. I didn’t know until after I could have frozen the duck fat but I know now for next time. With 12 of us under that roof, there’s a treasure trove of stories to mine and each of us have our own perspective and memories of the tale. I enjoy seeing the reaction you all have to the stories, not to mention what family members have to say when they read my “take” on a particular incident. I do wish to roast a duck with some sort of fruit-based sauce — your cherry sauce sounds perfect. This time around — just like the goat dinner yet to come — I wanted to prepare it as close as possible to the way my family once prepared it. Watch out next time! Thanks, Charlie. How can you study both Ancient History and Art History and never get to Rome? You really must do something about that. I have to warn you, though. I’m sure you’ll go to Rome and Florence, at least. given your education, you really must. Still, no matter how much time you spend there, it will not be enough — and you’ll wonder what took you so long to get there. Look at it this way. You went to NYC. What’s another 8 hours on a plane — if you’re going the long way — if you get to see the works of Da Vinci, Michelangelo, Raphael, Botticelli, and Caravaggio, to name a few? You have to see them to believe it. Truly. I love that story. That’s something that could have happened in our family. I’ll bet that duck tasted better with every telling of that story. I think back in those days we all had a chest freezer in the basement. Chest freezers were the LCD TV of their day. Every one just had to have one. It’s been a long time since I’ve made duck. I love the idea of adding duck fat to the potatoes, then roasting. Yum!! Great story about the “sordid act”. But it would be difficult to stay mad at someone who helps themselves to your provisions and then makes a fabulous meal out of it. Looking forward to the cookie post! Not to worry. Mom and Zia may have had their disagreements — pilfered poultry notwithstanding — but they were short-lived. The two were as close as could be. Duck is one of my favorite dishes John! (Next to pasta, pizza and sushi that is.) I love your preparation. It’s simple and allows the duck flavors and juices to take center stage. Love the story of Zia and the duck – and love the story of her retelling you the story. I like that your family keeps its stories alive. Thank you for sharing them with us too! Oh, Kristy. Sometimes I think you’re the sibling my Brother said was sold to the circus. Your likes mirror mine, especially with pasta taking the lead. Not to toot my own horn but that was one very good dinner. Wait till you see what we did with the leftovers. YUM! I can’t wait to see! Duck tacos? I just had duck tacos and they were out of this world. LOL – perhaps I am that sibling that went off to the circus. Sometimes I feel like my life is a circus. (in a good way) 😉 I’ve always joked that I should have been born to an Italian family. No one else in my family shares my tastes. Hmmm. 😉 Perhaps the circus isn’t so far-fetched! Very funny. Reminds me of the need to write one’s name on everything as they do in college refrigerators! At least they did in my son’s. He was the only one that cooked so everyone took his food. At least Zia cooked for your mom. I’d let anyone steal my food if they did that. Thanks for the photos, John! What a classic! Beautiful duck, and wonderful story. Great presentation on that platter! And love the story…. We love roasted duck although we do not eat it very often. This is dish is simply wonderful! Why is that, Francesca? Everyone has said how much they love it but rarely prepare it. I’m no different. Thank you for you kind works about our preparation. When traveling with friends, we often wonder what it would be like to live in Rome or Florence, completely ignoring that taking a holiday is completely different than living there. Still, how I would love to walk passed the Colosseum every day on my way to and from work. That is truly a picture-perfect roasted duck. It makes me want to dive in and try it, even though I’m not a huge fan of duck! You and the “duck thief” have “done yourselves proud,” as they say. 🙂 I loved seeing your images from Rome. It’s the only part of Italy I’ve spent time in, and really Rome is Rome and Italy is a different thing altogether. I always smile wincingly when I hear someone mention the art collections in the galleries leading to the Sistine Chapel. We were there just before the Jubilee, there was scaffolding everywhere and we spent a good portion of time inside the Vatican. When we headed to the Chapel we had to make a block and come in an unusual way, then suddenly found out that it would close at 2:00, and it was 1:00 already! We literally had to run down the galleries past all these great works of art…pointing and exclaiming over the master works we had to fly by in order to see the Sistine Chapel, which they had just competed cleaning. Not a recommended way to see such a collection! Your stories always bring a smile to my face and I am so glad that you have Zia to relive and share these beautiful memories with. My dear mother baked duck as well, not often but likely more often than your family. I will never forget the little bowl of duck fat sitting on the stove waiting for family members to tear off a piece of crusty bread and rub some of the fat onto it (with a generous sprinkling of salt, of course!) Roasting the potatoes in duck fat sounds absolutely decadent and I’m sure it was amazingly delicious. Recently I was at a Loblaws (a standard grocery store in Canada with a high end section) and noticed that they too are selling bottled duck fat. I was tempted to buy it but I resisted…knowing full well it’s full of chemicals for shelf life. Last year, I resolved to bake a duck myself, having never done it, but did not meet my goal so this winter I WILL. With your wonderful instructions I can’t go wrong. Thank you too for sharing your Rome photos, that is a place that is still on my bucket list and I really appreciated the views from your wonderful vacation. Thanks, Eva. I really am glad these posts remind you of your dear Mother and her kitchen. You’re probably right. I bet she prepared duck many more times than did Mom or Zia. I bet it was because there were too many people at the table to serve duck, unless someone wiped out a small flock. 🙂 And then there was Grandpa. He may not have liked it. As it was, he wasn’t a fan of turkey and insisted that capon be served. Zia obliged, stuffing and roasting 2 of the birds every Thanksgiving. I think you’re wise to avoid the bottled duck fat. Who knows what else is in that bottle to stabilize the ingredients? I’ve seen it here but, then again, it’s not something I’ve been looking for. I have seen frozen goose fat at one of our high end groceries but that was some time ago. Afterwards, I went back to the store to purchase some but that entire freezer section had been replaced. Apparently, the goose fat went out with the old freezers and I’ve not seen any since. Now, though, who needs goose when there’s duck around? I adore Italy but have only been to Florence, Milan, Venice and Lake Como (not to visit George, in case you were wondering) so there is still plenty left to see. Interestingly enough my dear Mom used to bake goose as well although I’ll be damned if I recall what it tasted like. It’s not popular in Canada. Ahhhh, leftovers! I had a duck leg confit left over from a photoshoot and I made Crispy duck in Chinese pancakes, so damn good. I’ve only eaten duck once and I must say, yours looks SO much better than the restaurant version I had. And the potatoes in duck fat sound amazing! Considering how rare either of us roasts duck, we were both very pleased, April. Using duck fat to roast the potatoes wa an idea that came once I saw so much fat in the pan. How could we let that go to waste? When i saw your comment here, I realized that I’ve not been receiving notifications of your posts. Sorry to have “lost” you. I’ll have to be more diligent and check your site regularly until things straighten themselves out. What a wonderful post John, loved the story of your Zia (and I can imagine the twinkle in her eye as she tells the stories of the past) 🙂 I will need to reference back to your recipe later and shall try it with the wild game duck that we often get in the fall. Thank you. With so many living under one roof, there are plenty of chances for eyes to twinkle when stories are told. Zia does enjoy this one. You do get plenty of wild game to prepare. Living here in Chicago, game meats are hard to come by. I do hope that if you try our recipe, you and your family will enjoy it. I love this story – nice of you aunt to invite your mom. 😉 I don’t think my kids have ever had duck…might need to introduce them to it. 🙂 I know my father and I are guilty of frequently stealing each other’s ingredients! But that duck does look delicious! Hahahaa! Oh Zia. What a great story… the generous thief! I’ve only roasted a duck once in my life but it was definitely worth the time and effort. Such delicious meat. Yours looks wonderful, John. Golden skin and a moist interior. I’m drooling at the thought! When you said “shared the freezer” I was wondering how the two families kept it straight as to whose food was whose. Of course, it apparently didn’t matter because it all got shared anyway. 🙂 So glad your mother got to taste her own duck. 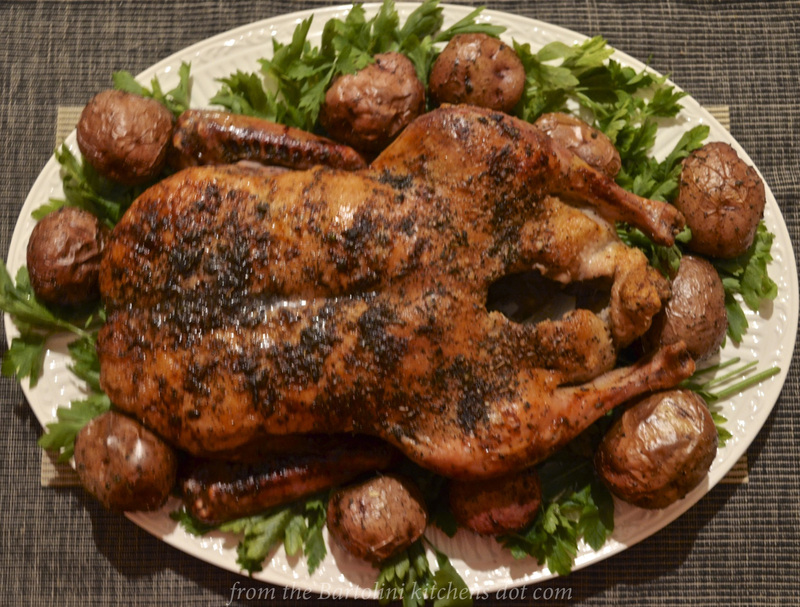 I love duck and as your recipe demonstrates, it doesn’t take much to roast a beautiful duck! John you forgot to narrate the story about this duck you roasted. Where did it come from? (LOL). I must say it’s a well roasted duck. I wouldn’t mind a drumstick or two. It looks delicious.